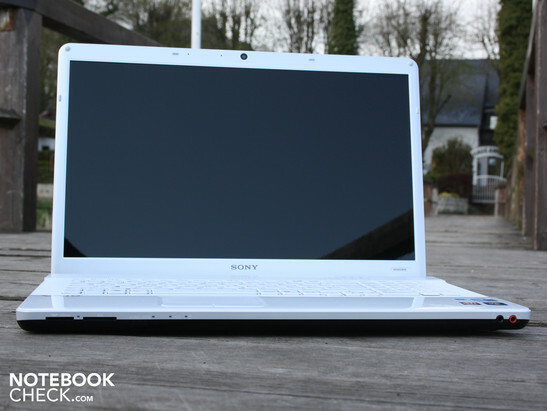 Sony's first 17.3 inch notebook for consumers costs less than 800 Euros, and has a Core i3 as well as an ATI HD 5470 on board. Whether or not the ceramic style hand resting area reduces our objectivity, can be discovered in this comprehensive review. The new EC-series by Sony was first officially unveiled in February 2010. With this Sony made the first attempt at providing a 17 inch notebook in the under 800 Euros segment. Along with this, there are also sister models with 14 and 15 inch form factors. 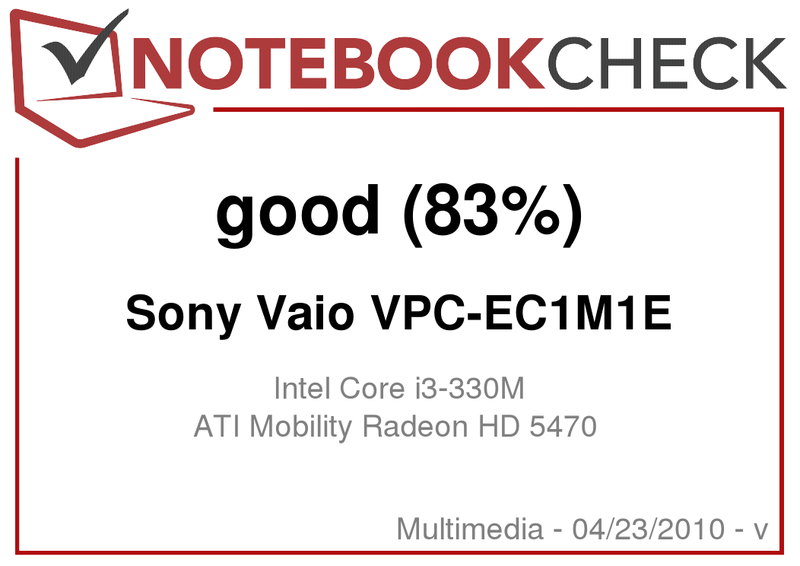 Compared to the entry level multimedia series EB (15.6 inch, Vaio VPC-EB1S1E/BJ), the EC1 differentiates itself by the form factor as well as in other areas. Technically the VPC-EC1M1E/WI provides solid mid-range processor and graphics components. With the Intel Core i3-330M and the ATI Mobility Radeon HD 5470, potential buyers don't have to worry about ending up with an office spec notebook. Technically the previous EC-series resembled the Lifestyle series EA (14.1 inch VPC-EA1S1E/L), which we were able to test recently. Optically the 17.3 inch variant is however significantly more appealing and mainstream suitable than its brightly colored EA-Lifestyle counterpart. We want to know whether approximately 800 Euros is a good investment for the Vaio VPC-EC1M1E. After all Sony is entering into a market, where similarly configured 17 inch notebooks are already available from 640 Euros. For example the mainstream model Acer Aspire 7740G-334G50Mn. 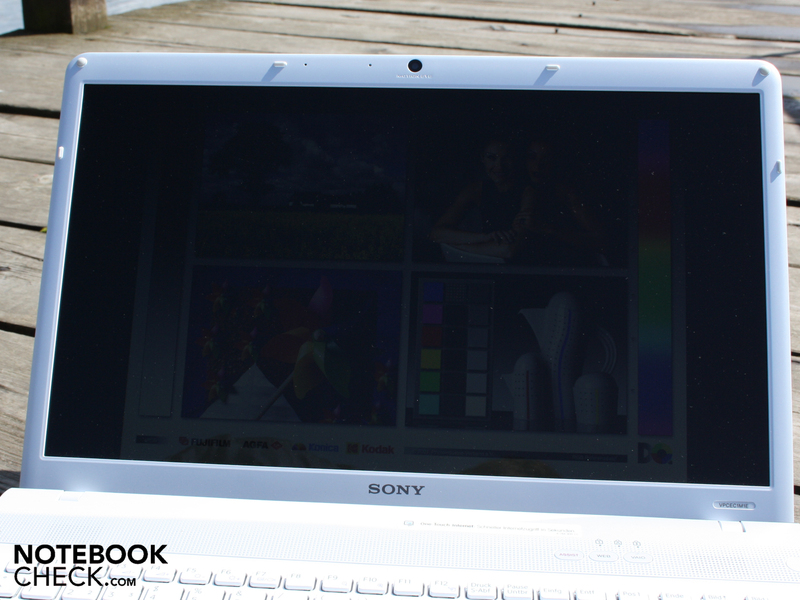 Details of what this Sony notebook has to offer are examined in this review. Silver on the outside, white on the inside. These are the conspicuous but decent matt colors with which the VPC-EC1M1E/WI presents itself to us. Starting with the hand resting area, which looks like very smooth porcelain, but nevertheless consists of plastic. The milky-white color has a light glittery effect. This only comes to light under sunlight though. The smooth surface is soon covered with our finger prints. But due to the color, these are almost invisible. The keys lie in a shallow depression, which is clad in a white plastic. 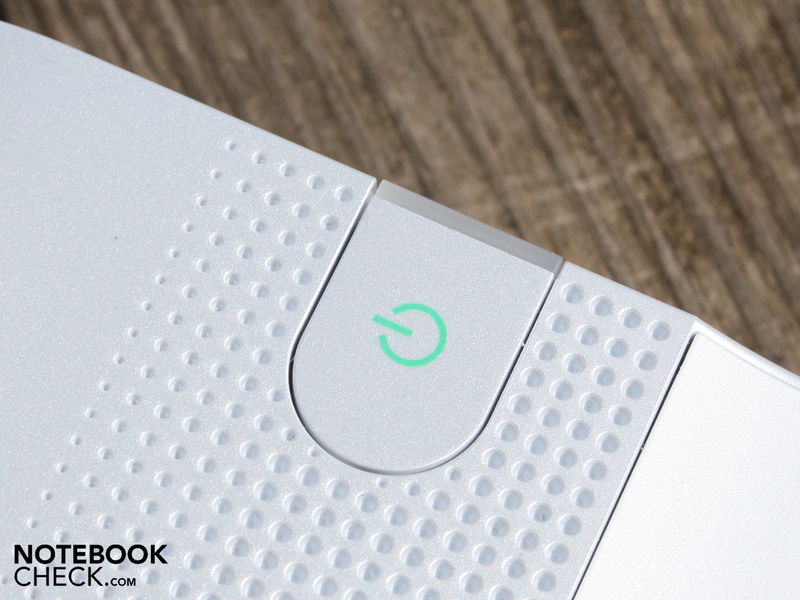 Above the keys is a slightly silver bar, which hides the loudspeakers, and has three buttons plus a power button. The 17.3 inch display is attached by two small hinges. These provide a good and firm hold on the display, and only bounce when the display is in the maximum open position. The maximum opening angle of the display is approximately 135 degrees. This is sufficient for tall people who want to use the notebook on their lap. One constructional weak spot is the very low over-arching rim of the lid. This is only a few millimeters above the table surface, when the display is opened all the way. In this case, if the notebook is lifted at the front, for instance to change positions, then the silver varnish will rub against the table surface or other surfaces. Scratches could be the consequence of this. The lid is relatively thick, which improves the stability. 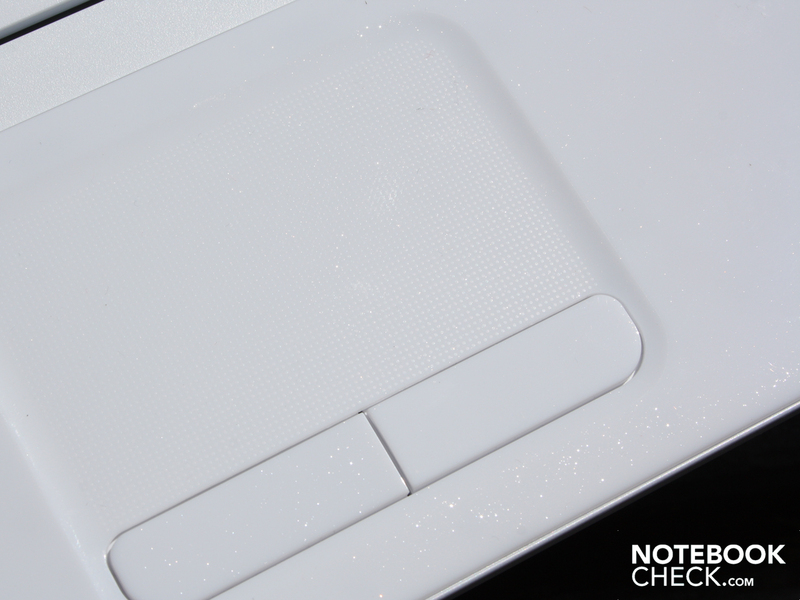 The top surface of the lid has enough space to the back of the display, so that small dents to the surface do not cause pressure points on the display. Holding the lid at the edges, we were only able to bend it a small amount. The chassis gives a rigid impression when held in your hands. The base plate doesn't give any room for dents, not even where the large panel for the two HDD slots is located. The milky colored hand resting area doesn't bend anywhere, and gives a solid and high quality impression. The bottom side gives access to the hard drive and RAM. 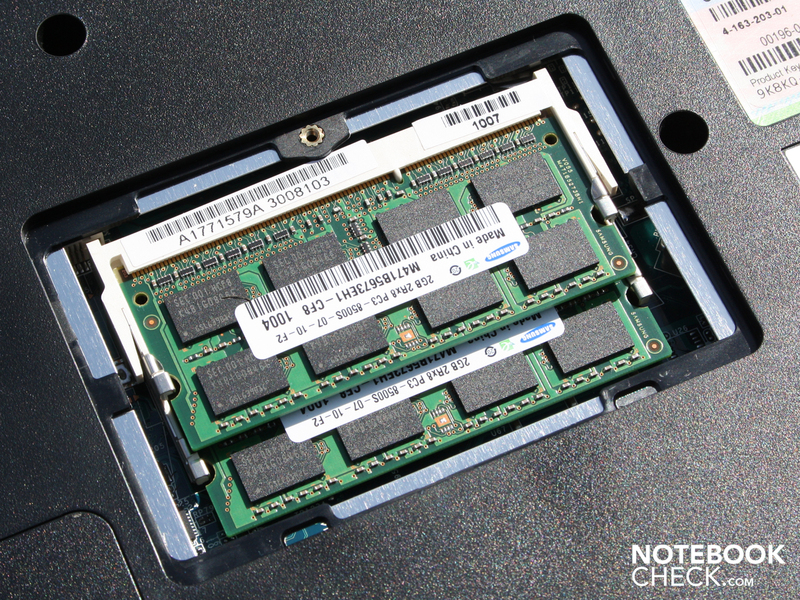 While the DDR3-RAM is in two slots containing 2.048 MB each, there is still a free space for another hard drive. The 2.5 inch HDD is screwed to a kind of frame, and is connected to the SATA controller with a ribbon cable. Next to this, there would be enough room for another second HDD. There is no connecting cable for this however, hence the dream of having dual HDDs in this Sony 17 inch notebook are therewith not possible. The Sony EC1 does not provide an abundance of interfaces. Nevertheless the interfaces, which include eSATA and ExpressCard34, will probably be enough even for slightly demanding users. 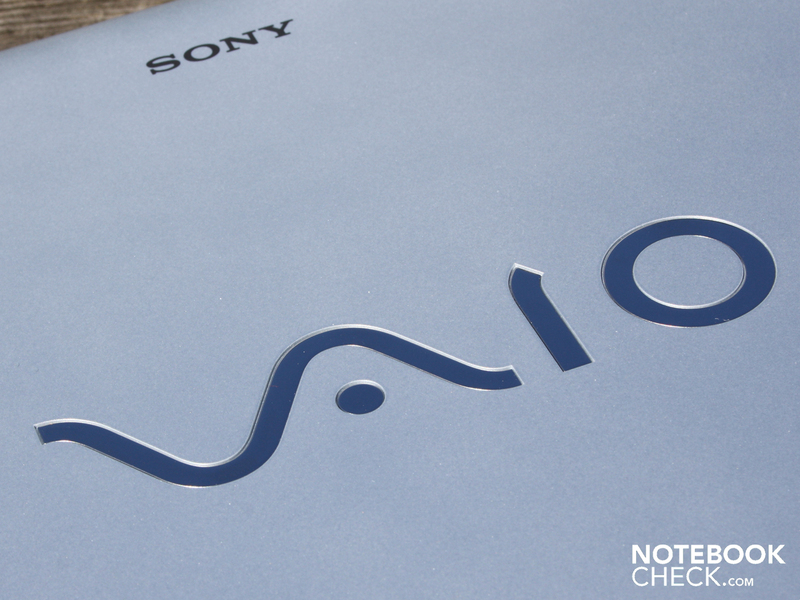 The Vaio VPC-EC1M1E has everything that is needed to connect the notebook to a modern home network. The following scenario should highlight the comprehensive options likely to be used in a typical home network. Connected to the eSATA interface is the fast external hard drive, on which could be stored movies for example. The NAS (Network Access Server) is supplied with data via a cable over the Gigabit Ethernet controller. Using the high bandwidth available over this type of connection, it is possible to stream high definition movies over the Ethernet network. These are then of course connected to the television using HDMI including audio. Last but not least, there is of course also a 300 Megabit DraftN connection available. For anyone who has noticed that an interface is still missing after this scenario, they can still upgrade using the ExpressCard34 slot. The location of the interfaces could be problematic. The VGA port is located so close to the HDMI port on the left side, that it is impossible to use both of them at the same time. 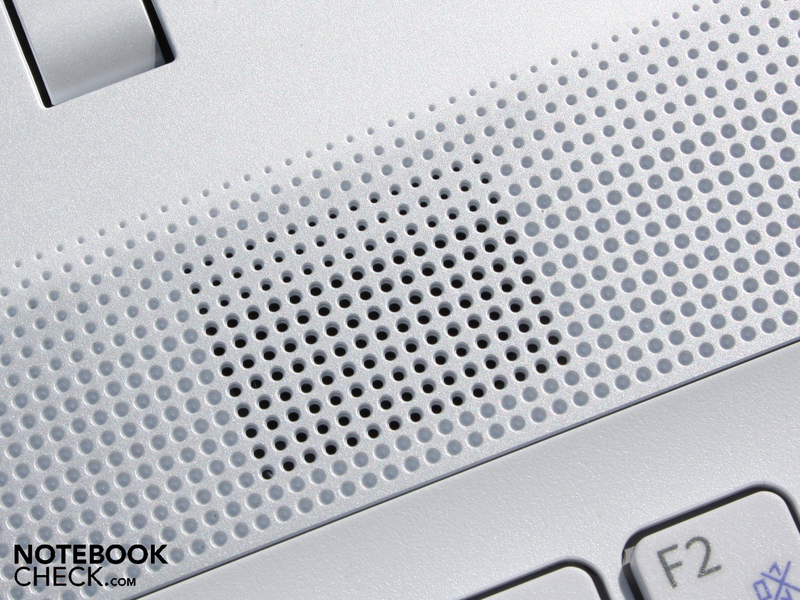 The location of the interfaces towards the front of the notebook could also lead to problems using a mouse. Anyone who doesn't want to fight their way through a combination of eSATA or USB cables, will soon prefer using the Touchpad instead. This is of course only the case when the cables are actually attached. Interfaces located at the back of the notebook would have been better for use at home. 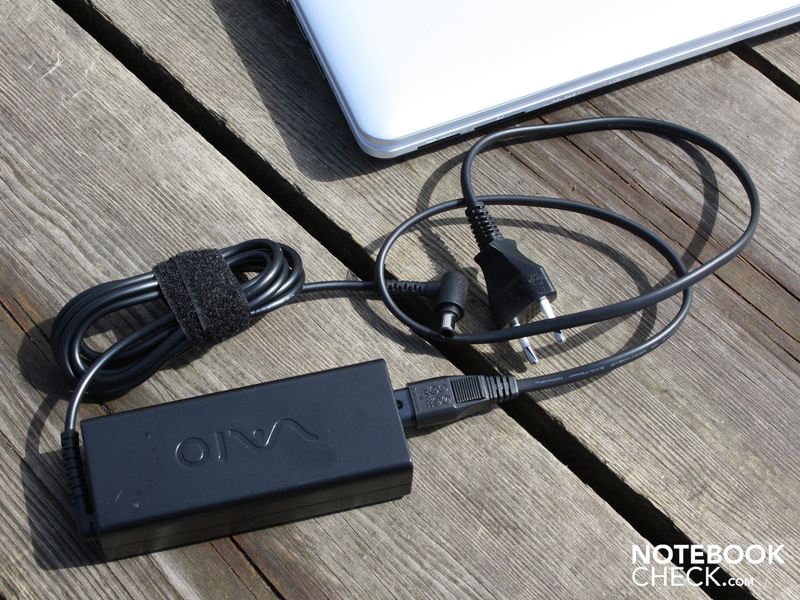 Particularly thick cables such as VGA, eSATA, and HDMI are better kept out of the way. The low over hanging display would then however no longer have been possible. 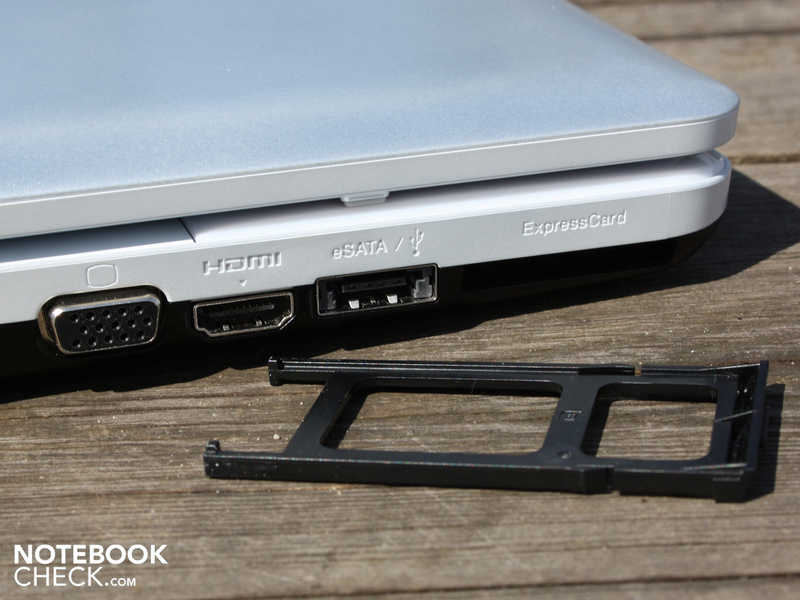 CardReader (SD and HG Duo) as well as the audio ports, typically for Vaio notebooks, are located at the front. The inclusion of two card readers is also typical for Sony. 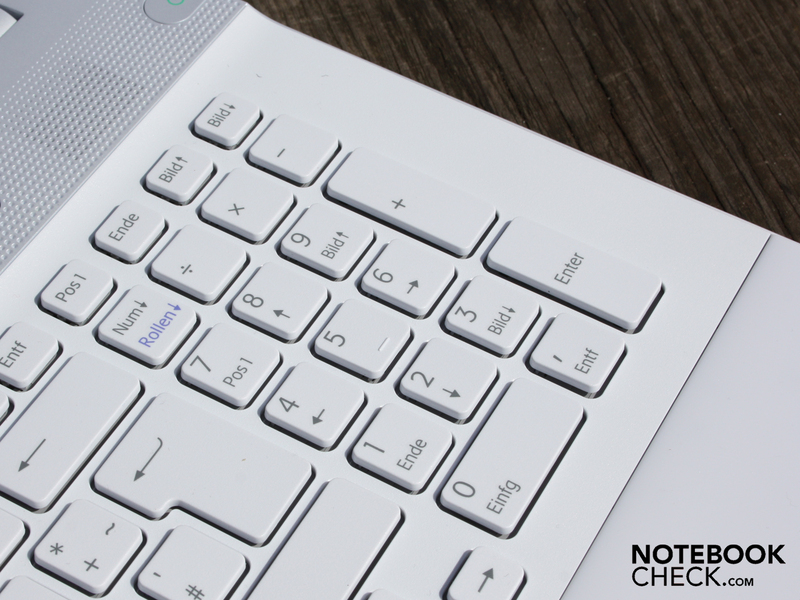 Sony has built a keyboard with good feedback into the Vaio VPC-EC1M1E. 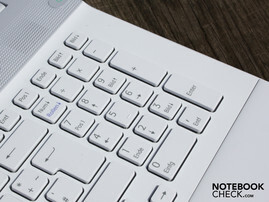 The free standing keys have a big gap between each other, and the 17 inch form factor provides enough space to allow a full alphanumeric keypad to be included. Using the keys is easy, as they are easy to find without looking, as well as having a grippy surface, a clear inflection point, and a long travel. The key stop is relatively firm, merely the alphanumeric keypad leaves a little room to play with. The surface of the keyboard doesn't give way anywhere. A positive aspect are also the separated arrow keys under the large shift and return keys. Writing with this keyboard flows smoothly from the hands. For those that know and value typical Sony keys (e.g. hard end stop), the VPC-EC1M1E will provide a very similar typing experience. 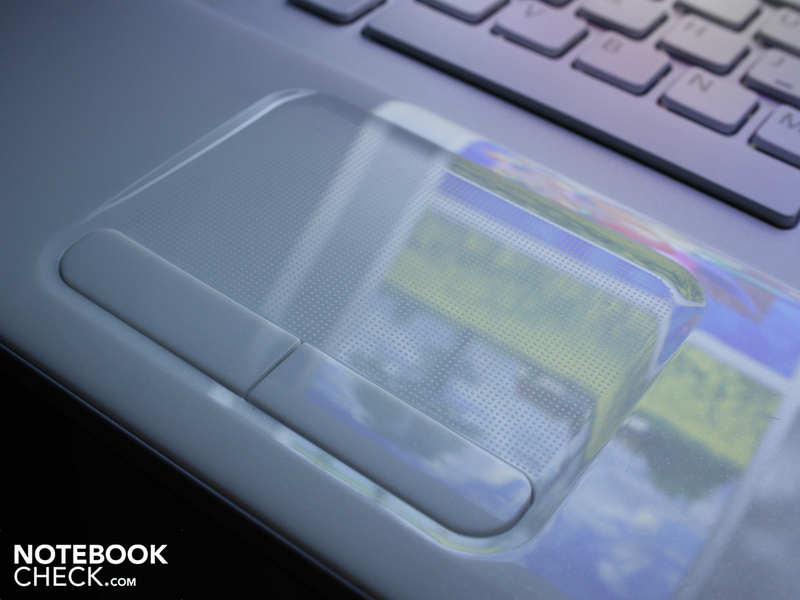 The Touchpad consists of the same milky material as the hand resting area. The surface additionally has small bumps. 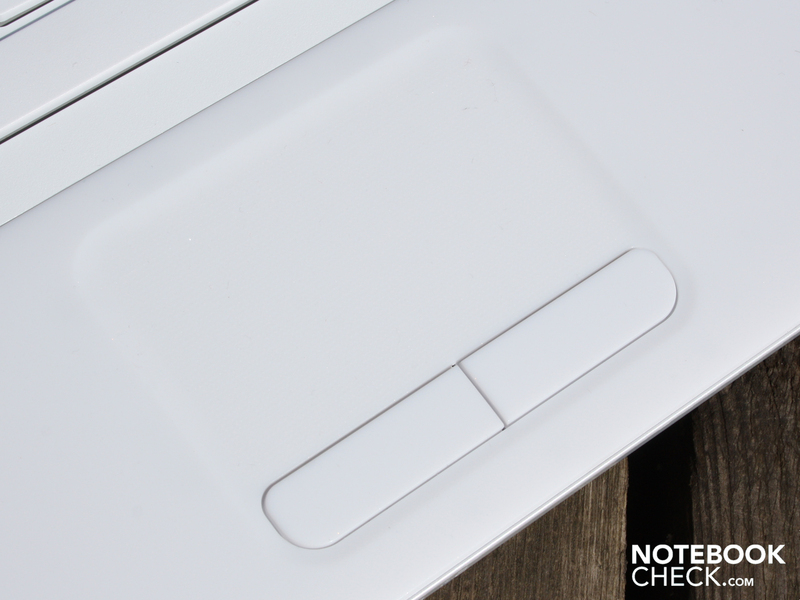 The Touchpad is sensitive right up to the edges. A narrow and flat edge separates the Touchpad area from the the hand resting area. It is a Multi-Touchpad by Alps. This mouse replacement recognizes the use of two fingers. This function can also be deactivated, as can the vertical and horizontal scroll bars. The feel of the Touchpad is not ideal. Our fingers did not slide over the bumps in the surface easily enough, and the buttons have a too small travel. The reflective display was unable to impress us with its too small contrast levels. We measured a contrast of 200:1 for the 17.3 inch display (1.600 x 900 pixles, WXGA++). 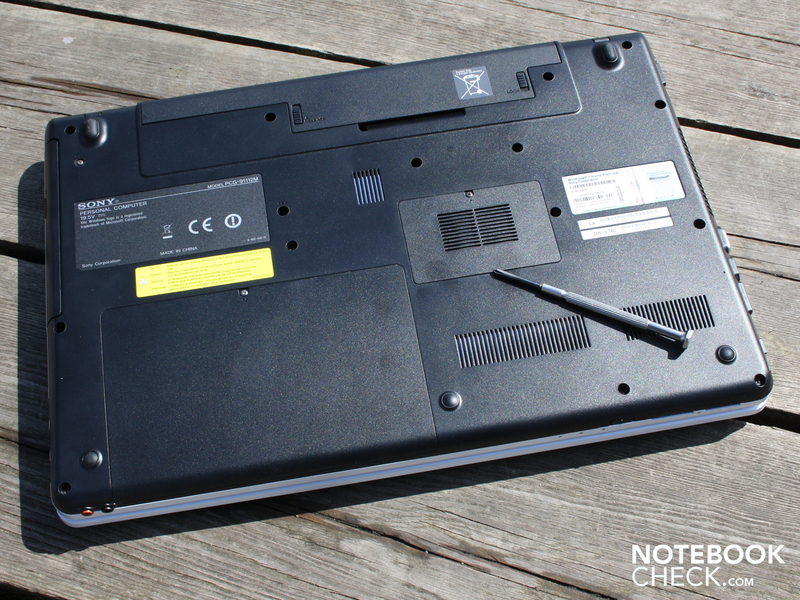 This is a typical value for Netbooks or office notebooks, which are not purchased for the quality of their displays. A higher contrast level of for instance 500:1, would make the colors appear significantly more lush. Movies or photographs would then be much more appealing to look at. Colors on the display don't look as bad as the contrast level would suggest. The glare display tricks the eye, and a movie such as Lord of the Rings is definitely watchable. The WXGA++ resolution provides a good oversight. Two open windows fit next to each other almost perfectly. Anyone who wants to work without any screen space restrictions should consider buying the sister model VPC-EC1S1E/BJ, with full-HD resolution (1.920 x 1.080). 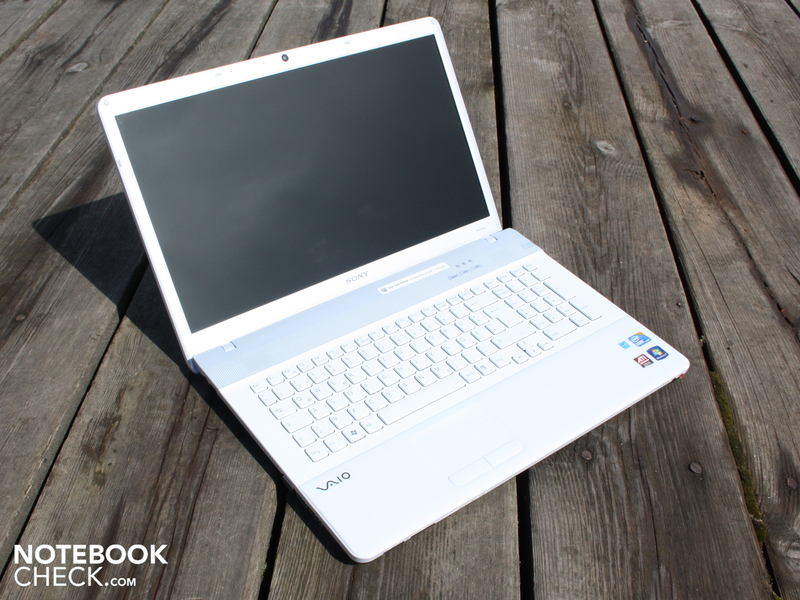 This 17.3 inch notebook also has an ATI Mobility Radeon HD 5650 graphics card, which is suitable for gaming. On average the luminance lies at 204 cd/m². The maximum brightness we measured was 212 cd/m² in the top middle area of the display. In light of the reflective characteristics of the display, as well as the not exactly impressive battery life, the lack of brightness is not especially tragic. The luminance is definitely sufficient for use indoors. For those that dare to venture under sunlight nonetheless, it is likely they will have to find a place in the shade wherever possible. The reason for this is the very reflective surface of the display. When looking at the screen from directly in front, we were only able to recognize a very dark picture. Under direct sunlight this problem is exacerbated. Looking at the screen from the sides, we were hardly able to recognize any colors or even writing. Viewing angles define the angle of deviation from the ideal seating location, directly in front of the display, where colors and writing is still recognizable. Perfect notebook displays offer a good picture, even when looking at the screen from the sides (60 degrees) and top (45 degrees). The TFT on this Vaio is far from this good, but is unfortunately in line with the majority of laptop displays. The horizontal viewing angle is narrow. Up to about 25 degrees of deviation from the frontal position, we were still able to recognize colors clearly. After this a strong inversion of the images on the display starts to take place. Looking at the screen from above and below (vertical), writing on the screen is readable at up to 30 degrees of deviation. Colors however already obviously start inverting from about 15 degrees. And the brightness also reduces quickly after this point. Sony has included the weakest of the new generation of Arrandale processors. The Core i3-330M (2.13 GHz, 3 MB L2 cache) has an integrated graphics processor (IGP), just like the i5-520M. The Intel HD is however disabled. The representation of images is taken care of by the dedicated ATI Mobility Radeon HD5470 (512 MB GDDR3). Assisting the CPU are four Gigabytes of SDRAM (2 modules). We discovered clear but very short latencies when switching the WLAN module on and off with the DPC Latency Checker. This is the result of time delays within Windows, which can disrupt real-time applications. The effects of this could for instance be short interruptions in real-time audio. The PCMark Vantage benchmark achieved 4.618 points. This score represents the application performance of a laptop. A glance at other systems with the Core i5-Prozessor 520M shows considerable discrepancies. The Dell Studio 1558 achieved a score of 5.929 points with the same processor. The Samsung R580-JS03DE even 6.026 points. The reason for this difference is the Turbo Boost feature of the i5/i7 processors, the generally higher clock speed, and partially also the weaker ATI HD 5470 graphics card. Its old news that a laptop with a Core i3 processor achieves less performance than one with a (more expensive) Core i5 processor. The Vaio 17.3 inch version lies on approximately the same level as the 15.6 inch Toshiba Satellite L550-207 (4.956 points, i3-330m). 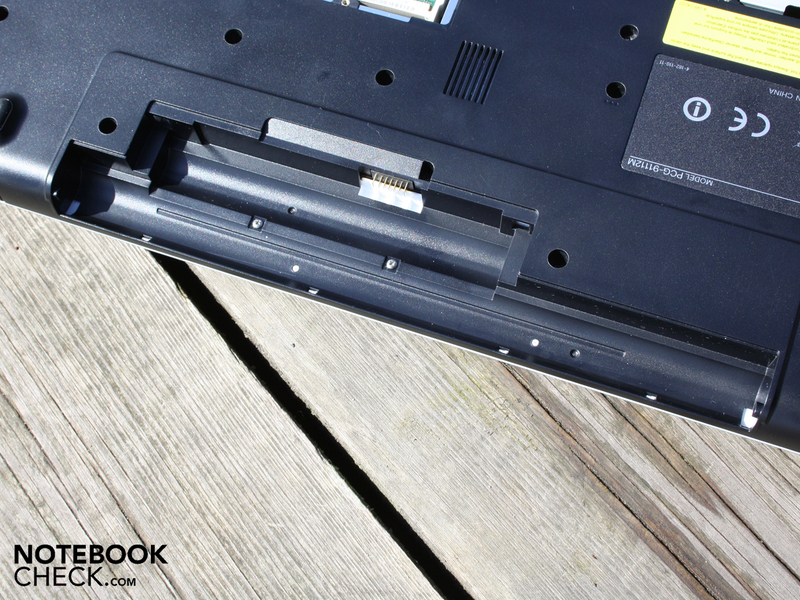 The Toshiba notebook has a clearly faster ATI HD5650, which has a positive impact on the gaming element of the system benchmarks. Worth remembering is that the Hyper-Threading feature of the Core i3-330M lets the dual-core processor process a total of 4 threads. Using this the operating system, as well as other simultaneously running programs, can be better tended to than with a Core 2 Duo CPU that only has two cores. With the Core i3 processor, users are equipped for the future. Users who need good performance are however advised to use a CPU starting with and upwards from a Core i5-430M. This supports Turbo-Boost and therefore overclocks single core applications better than the Core i3. Games benefit particularly well from the Turbo-Boost feature of the Core i5. 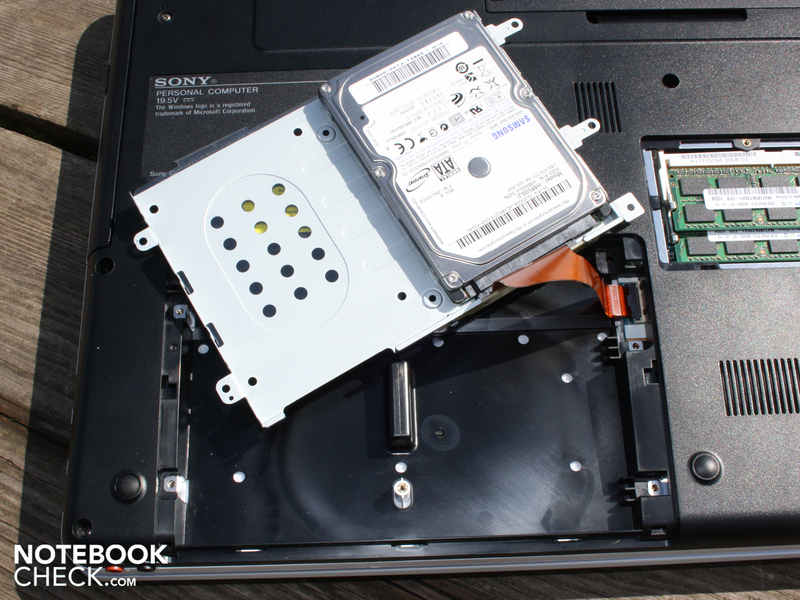 The Vaio EA1 has a hard drive with a rotational speed of 5.400 RPM by Samsung (HM500JI). The hard drive is very quiet thanks to being based on the Fluid Dynamic Bearing technology. The HDD can only be heard as a quiet humming when in operation. The 500 GB are sequentially read at 64.6 MB/s. An average value, which is achieved by many 2.5 inch hard drives. The ATI Mobility Radeon HD5470 has 512 MB GDDR3 of video memory, and is classified into the entry level mid-range by AMD. The memory has a clock speed of 790 MHz, and the processor a clock speed of 750 MHz. The GPU is DirectX-11 enabled, which is however unlikely to have a significant impact due to its moderate performance. In the 3DMark06 benchmark it achieves an unimpressive score of 3.057 points. Even an Nvidia GeForce GT 325M with a processor clock speed of 450 MHz, achieves a score of 5.333 points in 3DMark06. 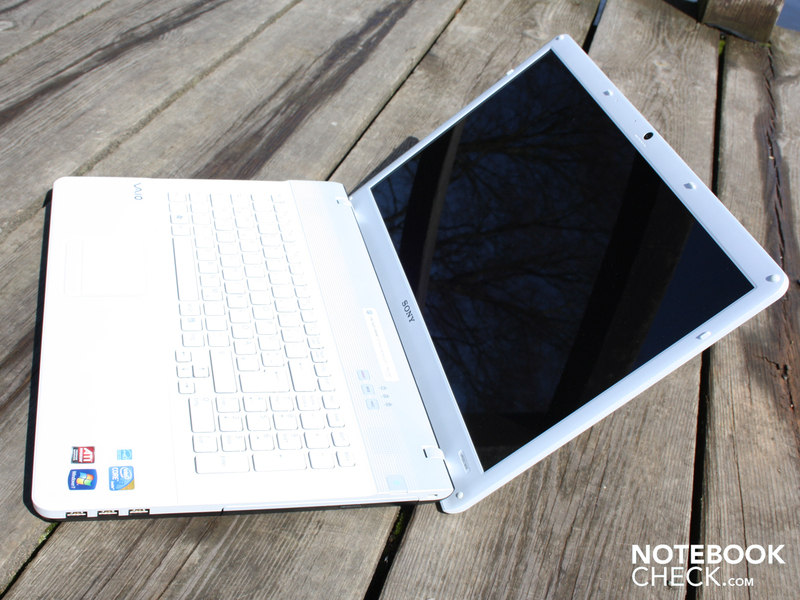 Gaming tests with the HD5470 have already been carried out for the notebooks Asus K52JR and the Acer 5741G. In both of these cases the main processor was also a Core i3-330M. The tests clearly showed that gamers are unlikely to be content with an ATI HD5470. Current and in particular demanding games cannot not be played satisfactorily. Popular games such as Battlefield: Bad Company, or Modern Warfare 2, cannot be played smoothly with medium settings. With the not so demanding Modern Warfare 2, 25 FPS are achievable using a resolution of 1.024 x 768 pixels (2xAA, Details Medium). In this scenario the game noticeably stutters during fast scenes with a lot of action. With a mix of low and medium Details (AA deactivated), a half way smooth gameplay is possible (approximately 30 FPS using 1.024 x 768). Older games such as Left4Dead can be played with higher levels of Detail settings. For those that want to play current games satisfactorily, an ATI HD5650 or an Nvidia GT 330M would likely be a better fit. Gamers would be well advised to consider the sister model VPCEC1S1E/BJ (17.3 inch), with an ATI Mobility Radeon HD 5650 and full-HD (1.920 x 1.080). This GPU is definitely suitable for gaming. When it comes to system noise, this 17.3 inch Sony shows itself from its best side. When running at a low level of utilization, the cooling system runs at the minimum number of revolutions. But never completely goes off. We measured 31.6 dB(A) in Idle-mode without constant utilization. The hard drive is not noticeable at this level of operation, since its quiet humming and the sound of its read and write heads moving is below the minimal threshold. When running at a high level of utilization, the cooling system makes itself clearly noticeable, and hence becomes quite annoying. During our stress-test (Furmark & Prime95) the cooling system turns up to a maximum of 40.4 dB(A). Not noticeable, but measurable, is a small variation of the noise to 39.8 dB(A). The cooling system hence runs at more or less a constant level regardless of the level of utilization of the CPU and/or GPU. When increasing the level of utilization, a sudden ramping up of cooling system noise makes itself conspicuously noticeable, after which it settles down again a few minutes later. Altogether the cooling system makes a good impression. When necessary the cooling system is quiet and runs at a constant level. In Idle-mode it hums away quietly in the background. The temperatures follow the example of the system noise. In Idle-mode the average temperature lies at only 24 degrees on the base plate. The hand resting area is also relatively cool at 24 degrees. The emitted heat when running at a high level of utilization increases clearly, but never gets out of hand. During the Furmark and Prime95 tests, the cooling system runs at its maximum level. 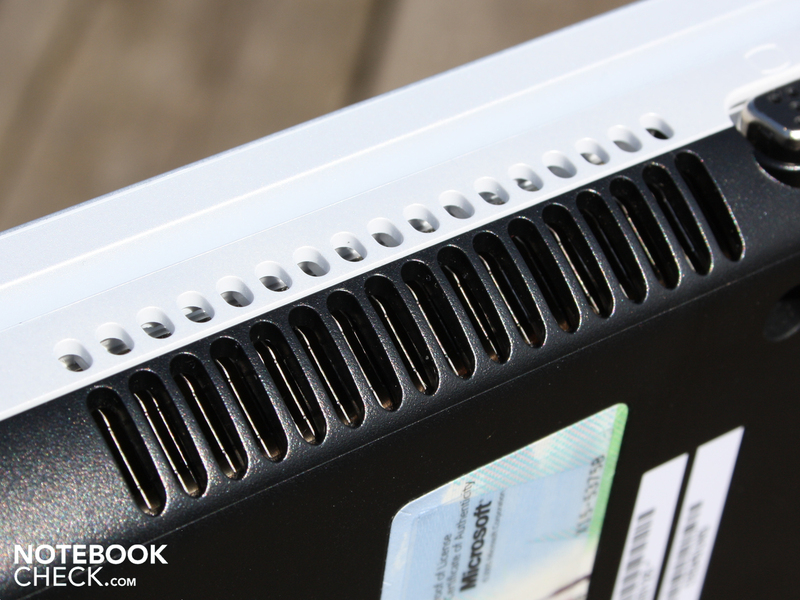 The bottom surface heats up to 43 degrees Celsius at certain points (close to the air outlet). The working surfaces temperatures stay at low levels, even when the system is running at a high level of utilization. We measured 30 degrees Celsius on the Touchpad. 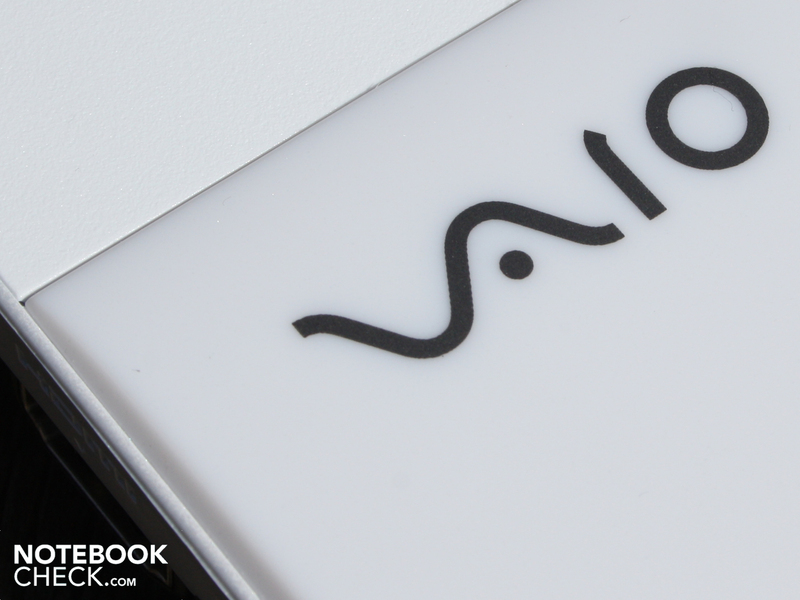 During the stress-test the Vaio EC1 processor reaches a maximum temperature of 67 degrees Celsius (temperature sensors). The graphics card is also not baked when submitted to stress. The GPU core sensor reads a maximum of 67 degrees. (+) The maximum temperature on the upper side is 35.3 °C / 96 F, compared to the average of 36.5 °C / 98 F, ranging from 21.1 to 71 °C for the class Multimedia. The two loudspeakers are located above the keyboard under a perforated plastic panel. 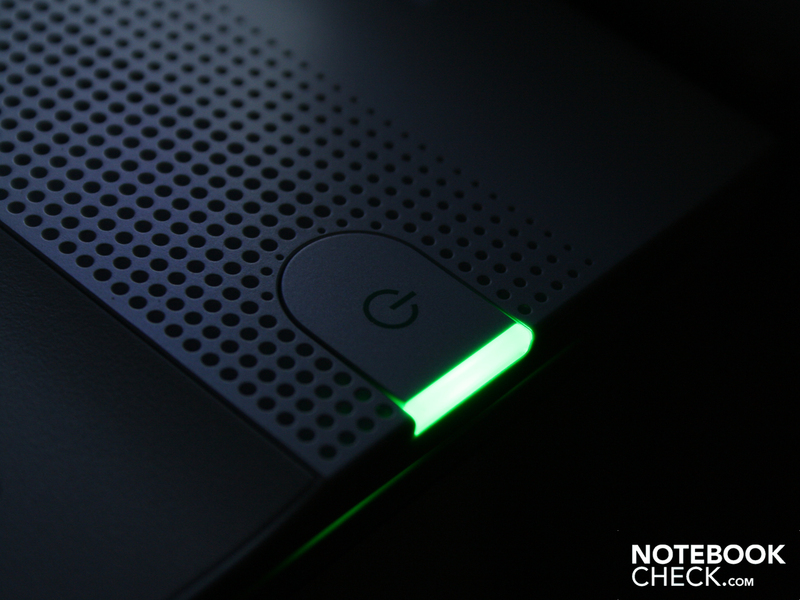 The sound quality demands of a multimedia notebook are not exactly satisfied. The sound is focused in the middle frequency range. High and low frequencies are neglected. There is no sub-woofer. The Dolby Audio Enhancer should be activated in the properties for the loudspeakers. This provides slightly more volume, and a bit more bass. The Dolby functions are inactive by default. 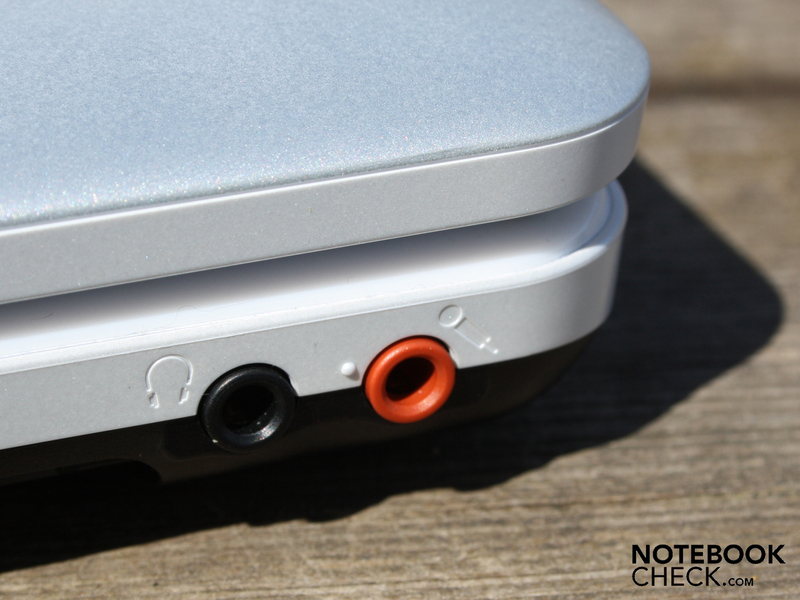 The connection for external loudspeakers via a 3.5 mm jack lead will likely be part of the daily routine for many people. The output level is very loud, and could potentially blow the diaphragms of connected loudspeakers. Even at low output levels there is no noticeable noise introduced into the signal. This 17.3 inch notebook only requires a mere 13.7 Watts (Idle). Nevertheless the four measured battery life times are relatively short. Even for the 17 inch form factor, which has to provide for a larger display. After approximately two hours of surfing with WLAN the battery is empty (108 minutes). We visited news portals, and the processor utilization stayed between 10 and 20 percent. The LED panel operated at about 150 cd/m² during the tests. So how long does a DVD movie run? The Lord of the Rings finished after two and a half hours (155 minutes). 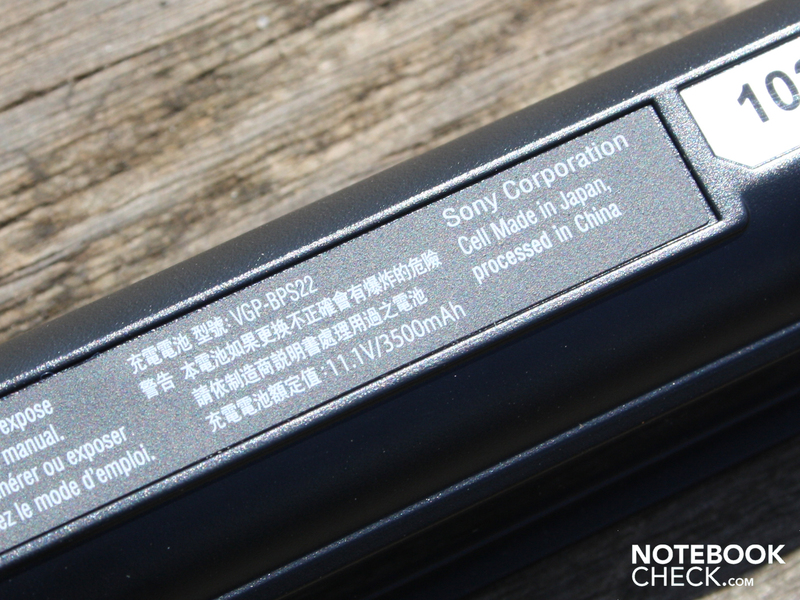 When running at constant high utilization the Vaio EC1 battery only lasts just under an hour (BatteryEater Classic-test: 51 minutes). The maximum battery life (Idle) lies at a significantly higher three hours (191 minutes). This is not much use for real-life scenarios however, since the processor had no work to do, and the display dimmed to a low level. The reason for the moderate battery life is the battery capacity of 3.500 mAh. 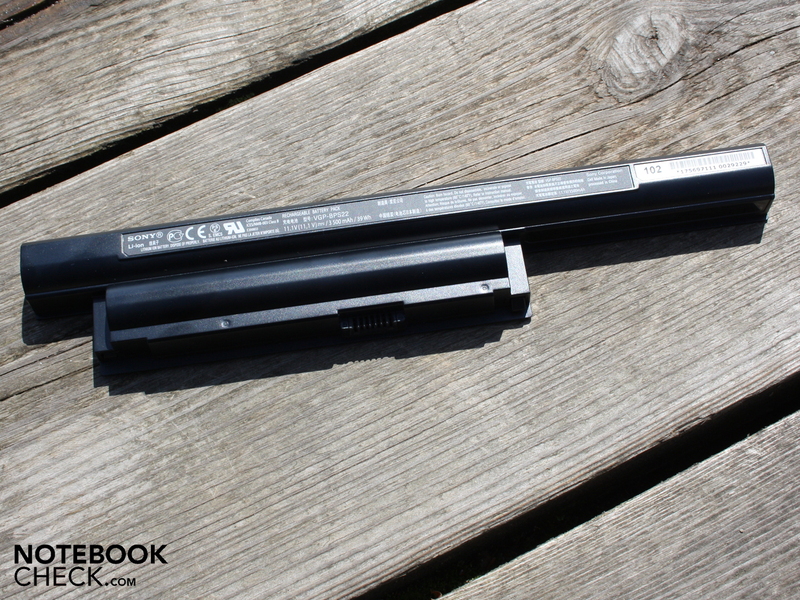 17 inch notebooks typically have 5.600 mAh. 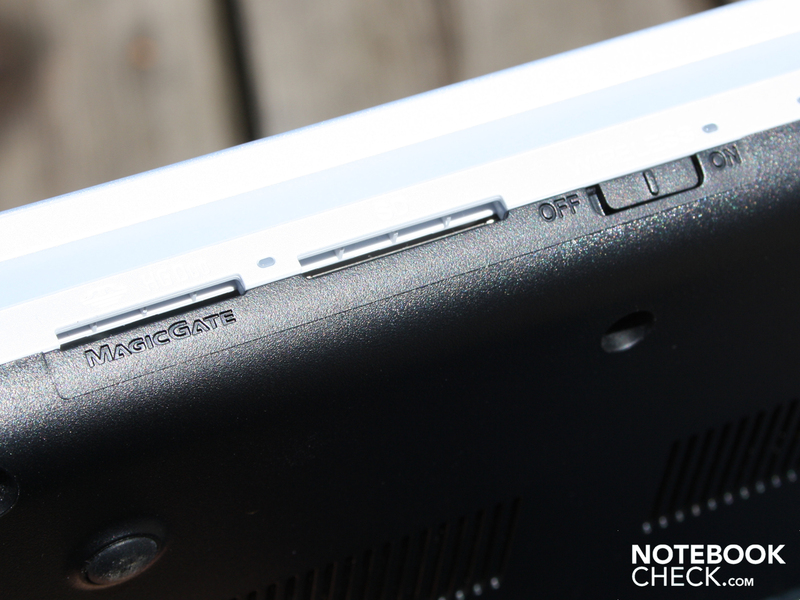 Even Netbooks have significantly higher capacities (e.g. 5.200 mAh). The Idle energy consumption lies at a mere 13.7 Watts. This is the high utilization consumption of a current 10 inch Netbook. The maximum Idle consumption (maximum utilization, everything activated, maximum brightness) lies at 22.7 Watts. Realistically users can count on an average value of between 25 and 30 Watts. This includes short bursts of high processor utilization. When the ATI GPU is active during a 3D benchmark, the average energy consumption rises to 49.3 Watts. 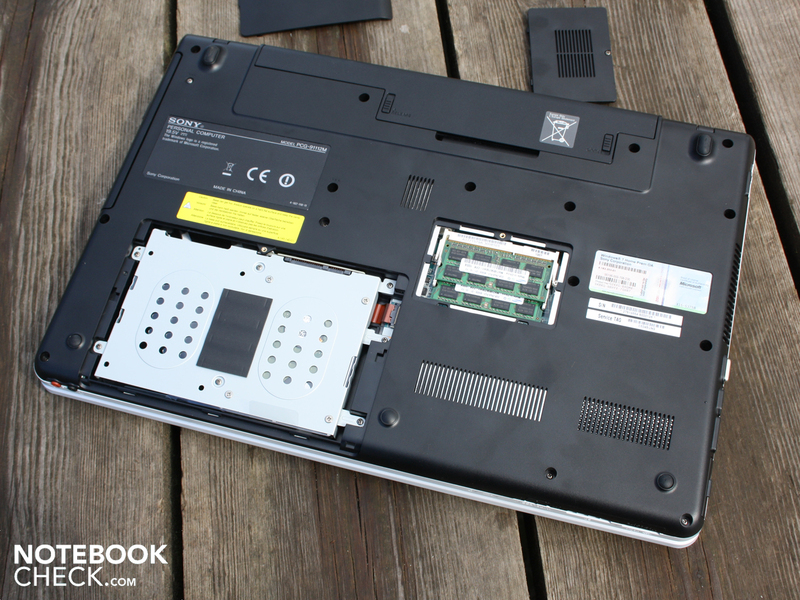 The maximum power drawn from the socket by this Sony 17.3 inch notebook is 61 Watts (stress-test with Prime95 and Furmark). The 90 Watt power adapter temperature rises to a warm 51 degrees under these conditions, but doesn't overexert it. The 17.3 inch Sony Vaio VPC-EC1M1E is a multimedia laptop that can also show its strengths when it comes to use as an office notebook. Particularly suitable characteristics in this respect are the good feedback of the keyboard, as well as the low temperature and system noise. 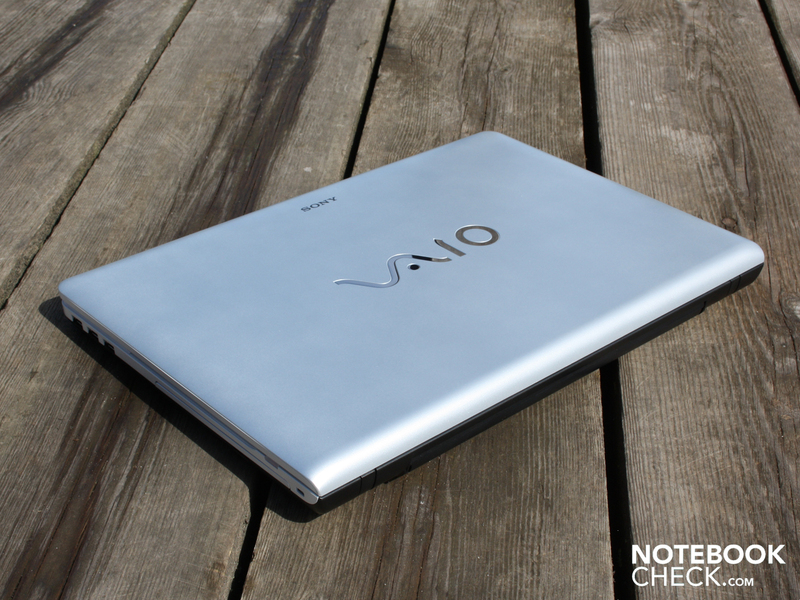 Technically the Vaio is more of an office all-rounder, with relatively high performance. The Core i3-330M (2.13 GHz) by Intel works at contemporary performance levels, but could use a little more power when it comes to demanding applications (Turbo-Boost). The entry level ATI Mobility Radeon HD5470 GPU is not suitable for current games. Advantages can also be found when it comes to the haptics and the build quality. Optically appealing, although also a matter of personal taste. The robust hand resting area and the lid make a high quality impression. The base unit feels good in your hands, with the firmly attached battery. Weaknesses in our eyes are merely the low hanging bottom of the lid, which can lead to scratches on the edge of the lid. 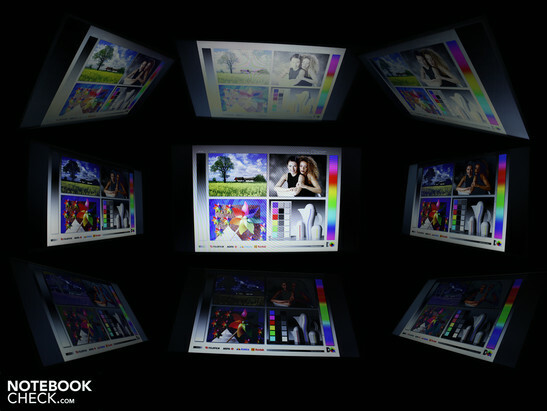 The display is sufficiently well bright for use indoors, but has a low contrast level. 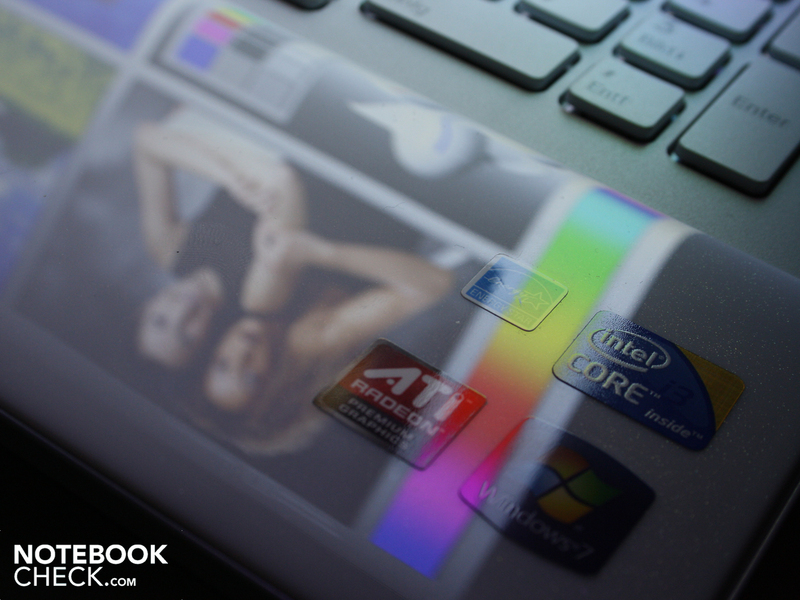 The mobility of the 17.3 inch notebook is bad due to the highly reflecting surface of the display. The battery life, at a mere 39 Watt-hours, is also short. When surfing with WLAN the battery life doesn't even exceed two hours. 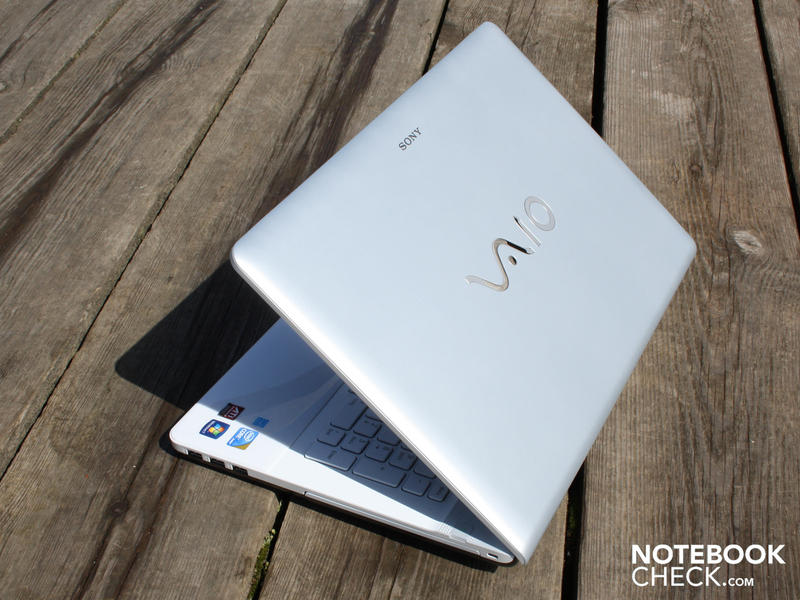 Vaio VPC-EC1M1E: Solid and pretty 17.3 inch notebook, that also offers office qualities. Weaknesses are the mobility and the display. 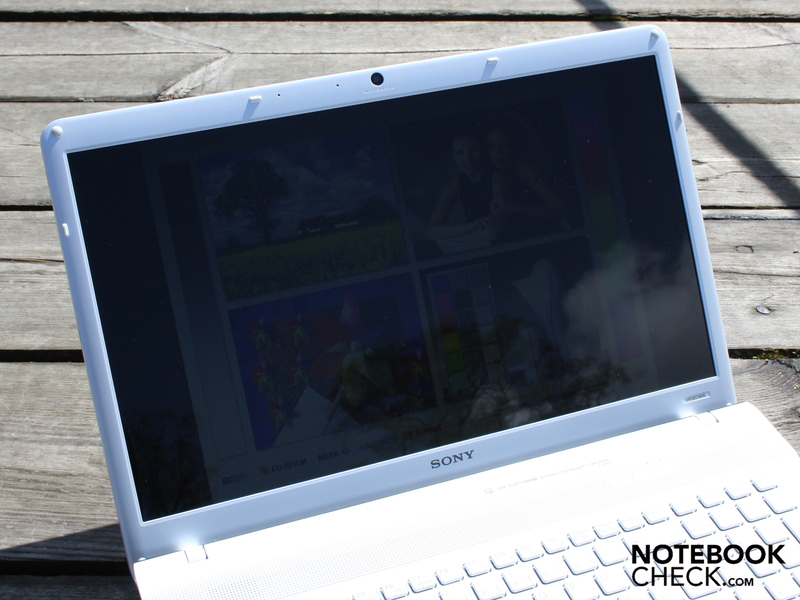 The Sony VPC-EC-Series represents their first 17.3 inch consumer priced notebook. and is not resistant against scratching. the firmly attached battery can lend a hand. When surfing however, this doesn't even last two hours. This is not only due to the 17.3 inch form factor, but also the low capacity battery at 3.500 mAh. Thats a mere 39 Watt-hours. The base plate harbors a disappointment. A 3.5 inch hard drive? No. There is enough space for two 2.5 inch HDDs. The second is missing a second SATA connection. There is only one socket for the ribbon cable. Upgrade not possible. Pleasing is the porcelain style surface of the hand resting area. The loudspeakers are only just good enough for music (mid-range response). The laptop is available from 780 Euros. 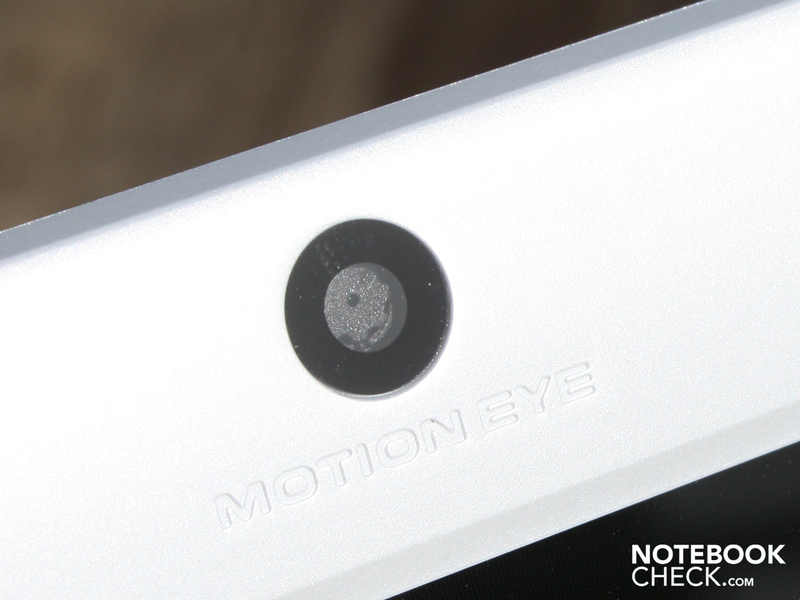 The white variant immediately caught our eye, which is why we acquired it to test. 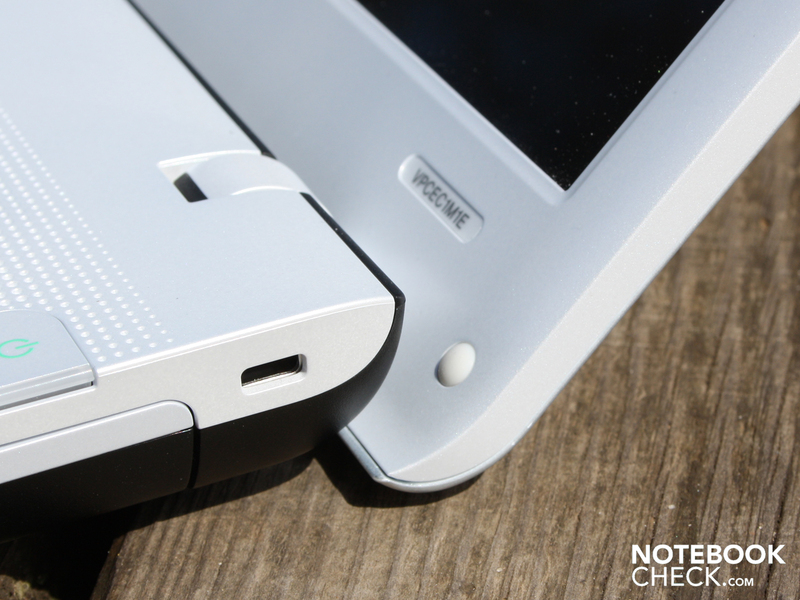 The base unit and lid are appealingly robust for this form factor. radiates a certain high quality build for under 800 Euros. as are the low hanging hinges. Which hang too low for the lid though. 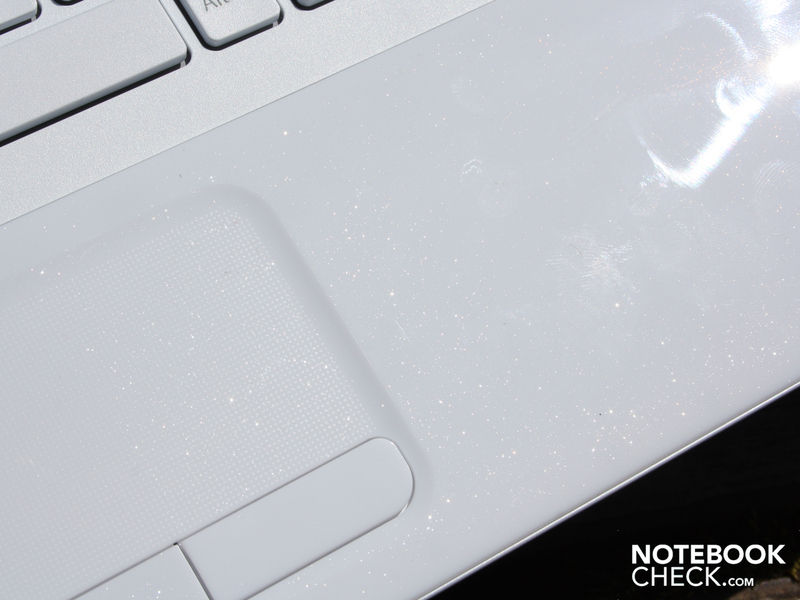 Moving the notebook can cause the edges to scrape the surface (blemishes). 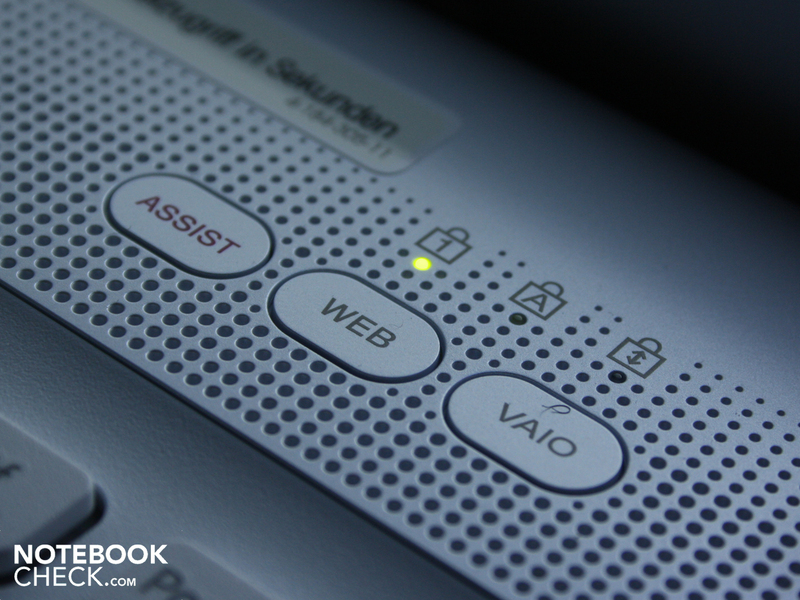 Three quick-start buttons make access easier (system, Internet, Vaio-Tools). The power button is located on the right of the chassis. in standby mode it flashes in a nice orange. The RAM is accessible as standard (2 slots). High quality materials and a pleasingly solid build quality with a consumer price tag. And in addition good accessories. A display with good contrast would have been the best improvement, along with a sub-woofer. 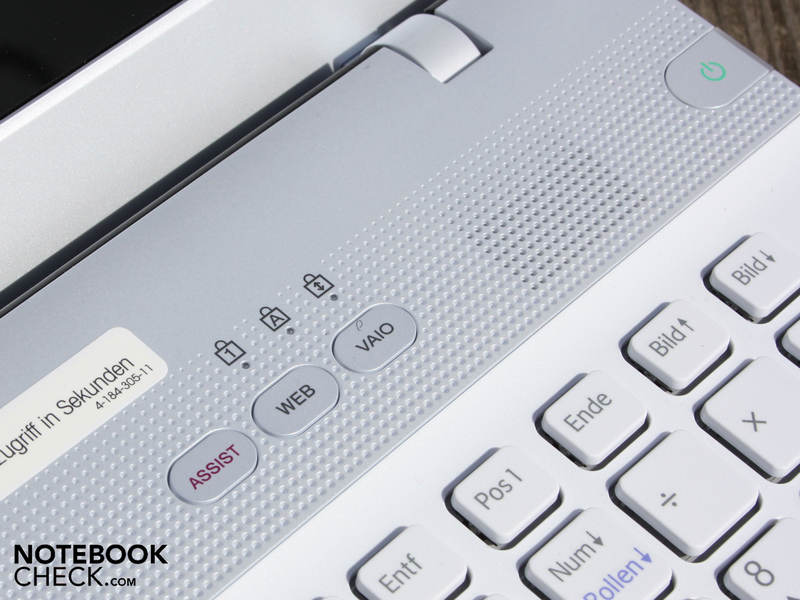 The good ergonomics and the great keyboard make this Vaio an office companion. For 640 Euros buyers could for example get the same hardware for less with the Acer Aspire 7740G. The ASUS N71JV - similar performance, but sub-woofer for a better sound. 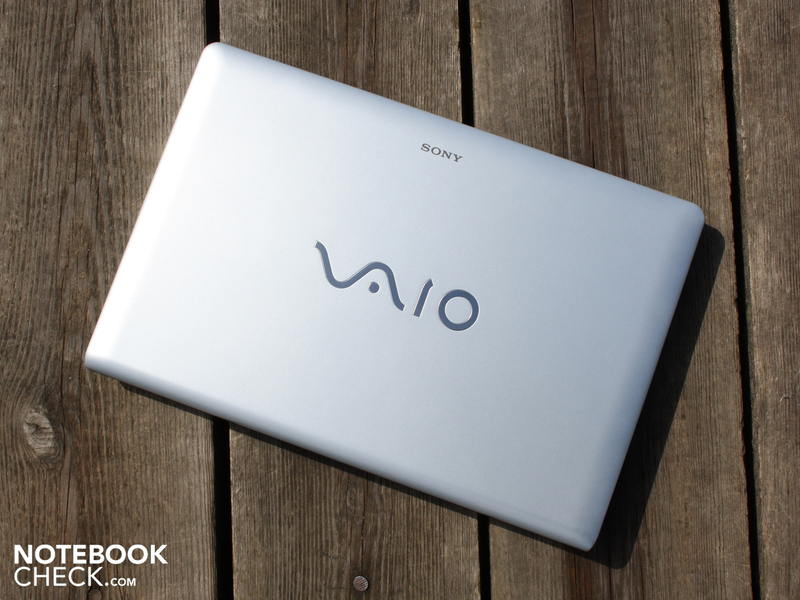 Sony Vaio VPC-F11Z1/E - without sub-woofer, but more expensive and with significantly more performance. Samsung NP-R780 Harry - more affordable, and with GT 330M for more gaming performance. Dell Studio 1747 - more performance, similar display, but higher temperature and noise. 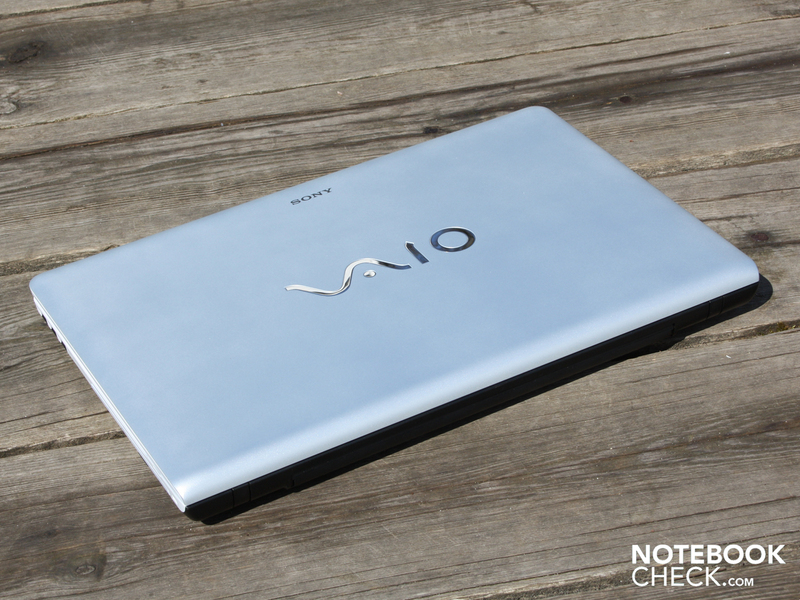 The Vaio look is however not available with the alternatives.